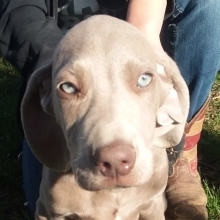 Weimaraners are easily distinguishable by their blue-gray coloring, (usually) docked tails and bright, amber eyes. This breed was originally bred in Germany to hunt large game, and today still has the same fearlessness and endurance that it did then. Weimaraners are an adaptable breed, but are fairly active and are happiest with room to run. These beautiful dogs are highly intelligent and naturally obedient, and make excellent, devoted family companion dogs.